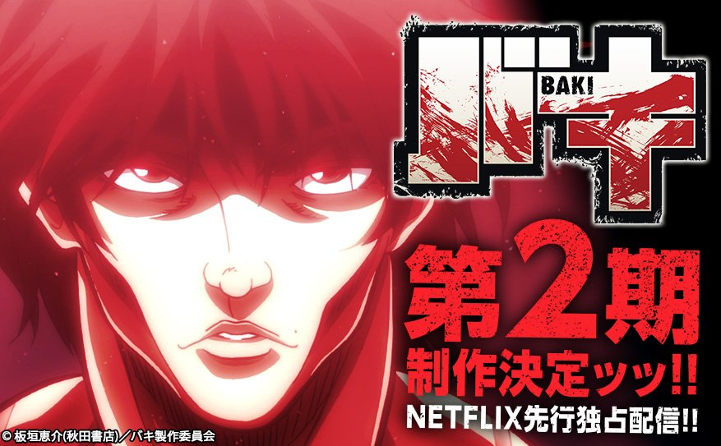 The 16th issue of Akita Shoten's Shounen Champion of 2019 announced on Wednesday that a second season of Keisuke Itagaki's Baki: New Grappler Baki manga is in production. Netflix will once again stream the new season exclusively. Based on Itagaki's manga, Baki: New Grappler Baki was serialized in Shounen Champion between 1999 and 2005. The series is a sequel to his original Grappler Baki manga that ran between 1991 to 1999 in Shounen Champion. Itagki penned two more sequels, Hanma Baki and Baki-Dou, with the latter recently ending last year with 22 volumes. The first anime season streamed on Netflix for 26 episodes during summer 2018 with directions by Toshiki Hirano (Kyuuketsuhime Miyu (TV)) at TMS Entertainment. An OVA to commemorate the franchise's 25th anniversary was bundled with the 14th Baki-Dou manga volume, which shipped in December 2016, and adapts the "Most Evil Death Row Convicts" arc that occurs in Baki: New Grappler Baki. Great to hear. This anime is wild. Probabaly going to be 2 cour like last time. For my money, excellent news. I've seen series that were crazier, or more violent. But I've never seen a show with the raw enthusiasm for it's lunacy that Baki had. It feels like a secondary school friend breathlessly describing the action movie they saw last night, after a restful 1.5 hours of sleep and a glass of Diet Adderall. Animation got a little wonky at times in the first season but The fights were too good to complain. I’m hype for season 2! 26 episodes of brutal action, how can one even hate this anime? Yoooooooooooooo very hyped for this. straight men doing straight stuff... What why the hell not?! Yes!!!! Baki was one of the most enjoyable anime of 2018. So hyped we are getting more! Nice one! I really need to watch this baki soon. Still need to watch the second season from the original serie, but this is great news. Very excited to watch Yujiro vs the ancient chinaman animated. Baki is one of my favorite series. YES! my friends and I enjoyed the hell out of Baki. Great news! Yes good good good.I enjoyed the randomness of this series.